With the help of Reading Room Cliffs Notes, you've kept up with the Reading Room's dozens of summer events. From authors to nonfiction, poetry to spelling bees, (and more! ), the summer has been packed with events for the literary-minded of all stripes. 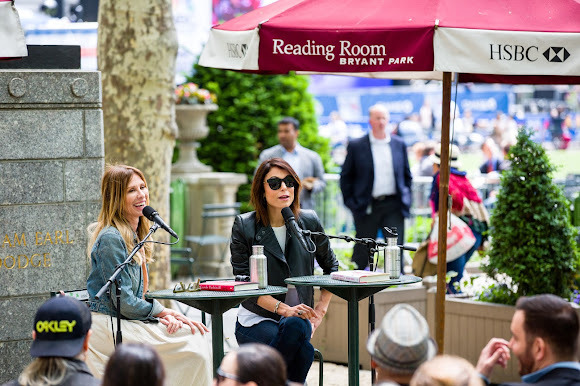 Unfortunately, readers know that all good books must come to end; the Reading Room closes for the season on October 13.
interviewed by her co-star Carole Radziwell. 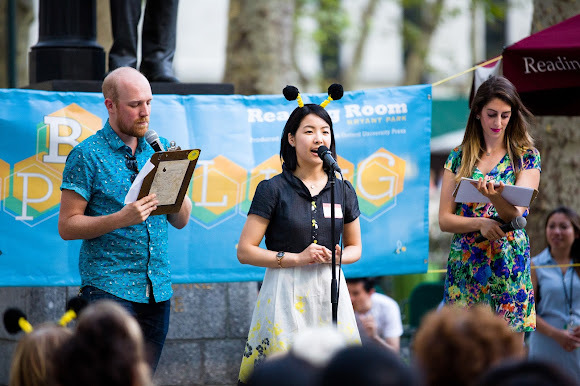 Participants in Bryant Park's first-ever spelling bee donned bumblebee antennae. We're closing another "chapter" in the Reading Room story, but don't despair: you still have Word for Word Winter Poetry to look forward to. Best of all, it's located indoors! Stay tuned for the 2015 schedule. While you're marking your calendar, don't forget to pencil in Poem in Your Pocket Day, scheduled for April 1, 2016.